Yesterday I went on a tour of St Pancras Chambers (erratic Flash site), the official title for the vast, grand brick building that forms the front of St Pancras railway station in London. In the 19th century the building was originally the swanky Midland Grand Hotel, which closed due to poor profits in 1935. It then became railway offices and had many of its large, elegant rooms split by temporary walls, some elaborate and colourful patterned walls painted over, and holes punched in ceilings to provide access for power and phone cabling. While the original building at Euston station was demolished, St Pancras Chambers was saved from the same fate in the 1960s and given Grade I listing status. The building closed due to fire regulations in the 1980s and the exterior was renovated the following decade. I don’t remember it before renovation, but apparently its red brick and cream stone were completely black with soot. The tour is well worth going on. Saturdays and Sundays, 11am or 1.30pm, £5, first come first served. The guide was enthusiastic and knowledgable and I think we were in there for well over an hour. If you want to go, don’t put it off too long, as the building is due to be renovated soon, becoming a Marriott hotel and Manhattan Loft Corporation apartments, pencilled in for completion in 2007. I took some photos of the graceful, cantilevered stairwell, which, without its original thick carpet looks a little more Harry Potter than the height of luxury it once was. The place has been used for a fair number of film and photo shoots including the Spice Girls’ Wannabe video. SPECIAL FACILITIES to be afforded to Passengers travelling from London, St. PANCRAS STATION. 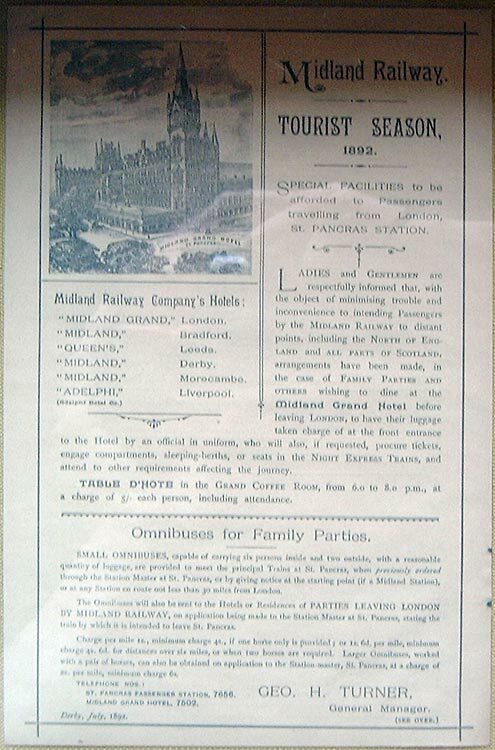 Ladies and Gentlemen are respectfully informed that, with the object of minimising trouble and inconvenience to intending Passengers by the Midland Railway to distant points, including the North of England and all parts of Scotland, arrangements have been made, in the case of Family Parties and others wishing to dine at the Midland Grand Hotel before leaving London, to have their luggage taken charge of at the front entrance to the Hotel by an official in uniform, who will also, if requested, procure tickets, engage compartments, sleeping-berths, or seats in the Night Express Trains and attend to other requirements affecting the journey.